Rising comfort levels with virtual assistants and chatbots, as well as advances in technology, voice commands and messaging apps are presenting new sales platforms for consumers and retailers to explore. 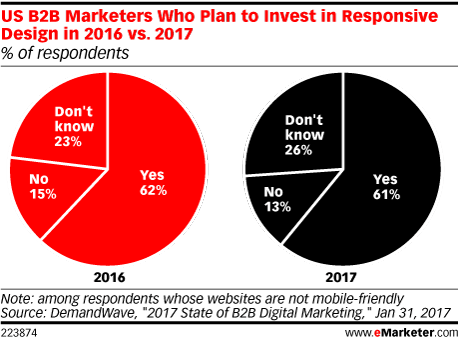 Mobile continues to be a challenge for B2B marketers. eMarketer analysts Jillian Ryan and Cathy Boyle discuss the ways that B2B buyers have shifted their behaviors around mobile, and the disconnect that exists between buyers' expectations and the customer experience. Are drone deliveries likely to be coming to your neighborhood soon? eMarketer's Ezra Palmer and Marcus Johnson discuss the future of drone delivery, and how technical and business factors, as well as consumer attitudes, are likely to affect mass drone deployment. Part two of our series of conversations about apparently outlandish ideas that could become everyday realities. In the wake of the widely streamed James Comey testimony, eMarketer video analyst Paul Verna breaks down the live video market, and how it fundamentally differs from traditional live TV. Ecommerce is increasingly conducted using images, videos and augmented reality. This trend partly results from changing consumer behavior on mobile—where users prefer visual communication and visual media platforms—and improvements in computer vision driven by artificial intelligence. eMarketer's Oscar Orozco and Patricia Orsini break down digital ad spending by industry. How do different industries allocate their budgets for digital advertising, and what's behind their spending decisions? eMarketer analysts Lauren Fisher and Paul Verna sit down to discuss the prevalence of ad fraud associated with digital video, and what the industry is doing to deal with it. Are millennials careful with their money or are they, as one critic put it, wasting their cash on avocado toast? eMarketer forecasting analyst Marcus Johnson and demographics specialist Mark Dolliver take a look at the data. eMarketer's Paul Briggs joins the 'cast to talk about the unique characteristics of French Canada when it comes to digital usage. French Canada spends considerably less time online than the rest of the country. What's behind this digital gap? Are driverless cars close to market, or is a full-fledged launch still well off in the future? 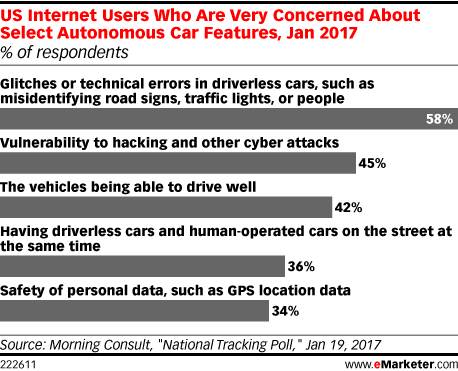 eMarketer's Ezra Palmer and Marcus Johnson consider the regulatory, technical and psychological hurdles that must be cleared before autonomous vehicles become commonplace. Part three of our series of conversations about apparently outlandish ideas that could become everyday realities. Early in the internet age, Hispanics were on the wrong side of the digital divide, lagging the general population in terms of internet access. 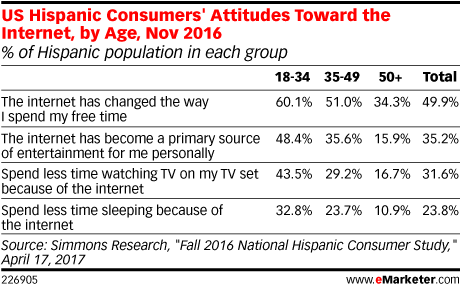 Now, the majority are internet users, although Hispanics still underindex a bit for internet penetration. In the first of a series of conversations about ideas at the bleeding edge of innovation, eMarketer's Marcus Johnson and Ezra Palmer discuss the concept of telepathic texting. Is this an outlandish idea, or will it become a marketplace reality? More and more consumers rely on images as they shop. What does it mean for retailers and marketers? eMarketer analysts Yory Wurmser and Cathy Boyle talk about how sellers are responding to the shift. According to eMarketer’s latest forecast for ad blocking activity in France, Germany and the UK, use of ad blocking software is still growing, but growth is slowing down. How many people are using digital cash? How important is it to today's digital economy? Will use of cryptocurrencies such as Bitcoin become commonplace in the near term, or will it remain a niche behavior? Analyst Nicole Perrin joins the cast to discuss the current state of cryptocurrencies, and how usage may change in the future. eMarketer's Ezra Palmer, Mark Dolliver and Yory Wurmser sit down to discuss a key smartphone feature—the camera—and how consumers can use it to capture the world around them. 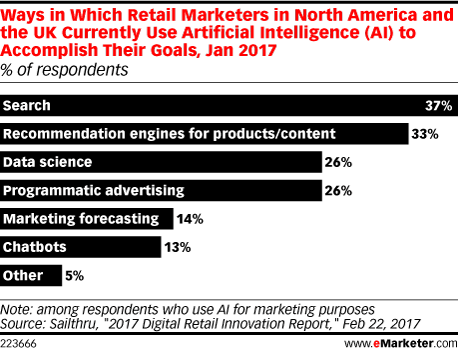 eMarketer forecasters and analysts gather to discuss the company's new forecast for how many people use voice-enabled digital assistants, and then consider how assistants are being used, and what the next phase of development might be. In the latest episode of eMarketer's "Behind the Numbers," analysts Paul Verna and Gerard Broussard and news editor Rimma Kats discuss key highlights from last week's Upfronts, as well as TV networks' approach of making digital advertising the bogeyman. eMarketer's Marcus Johnson, Cathy Boyle and Chris Keating sit down for a two-part, data-packed conversation about smartphones and their effects on our lives. Can smartphone addiction be quantified?